I left Philadelphia yesterday afternoon, another short trip on the still pleasant Megabus got me into New York just before four o’clock. 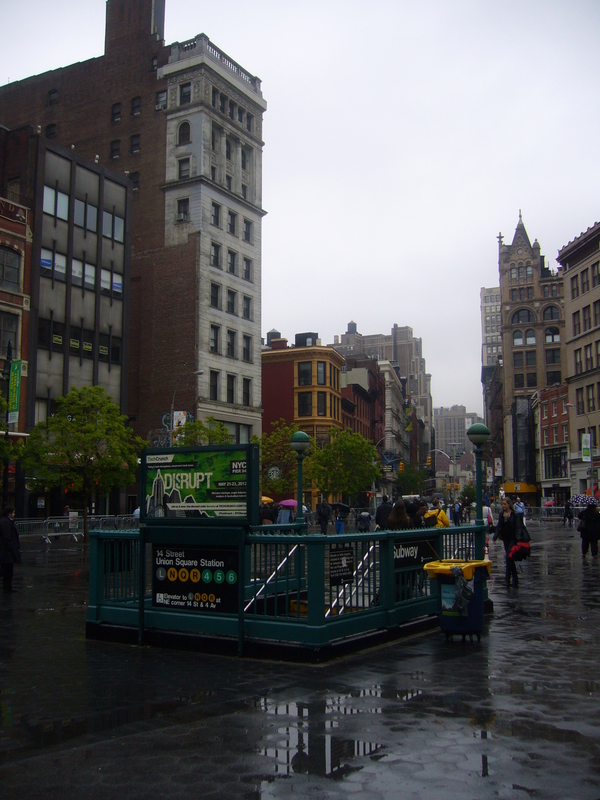 I had to navigate the subway out to East Williamsburg where I would find my hostel, but this was pretty easy and I arrived at the New York Loft Hostel just before five. East Williamsburg is probably the hippest place I have been to since East Berlin. Everyone looks like they’re aged between 18 and 24, all dressed like they’ve just finished a photo shoot for a glossy magazine, and sporting excellent haircuts. 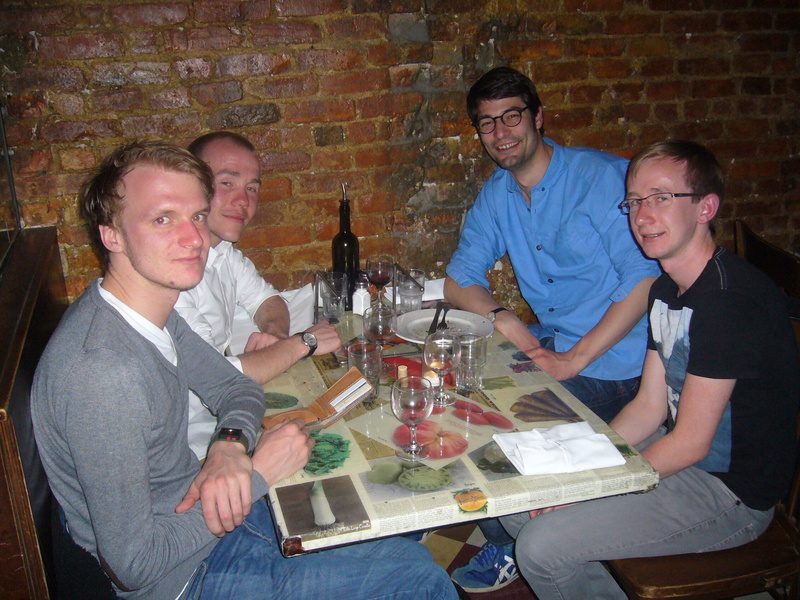 Once settled into the hostel, I got chatting to three German guys sharing my room; Christian, Tim and Mortz. All three of them are doctors, on a two week vacation road tripping from Boston to D.C. We exchanged stories from the places we had been to respectively and chilled. When they were getting ready to head out for the evening, I asked if they would mind if I would join them, and fortunately for me, they were more than happy to take me under their wing for the night. We headed out to Bedford Avenue, Mortz, who had lived in New York briefly, knew of what he considered to be the best pizza place in the town; Fornino. Once inside, I let the guys know that unfortunately for them, I was a vegetarian. They took this news surprisingly well and we enjoyed a meat free bianca and a calabrese with a bottle of red. While it was no Fire & Stone in terms of originality, it certainly turned out to be some of the best pizza I have ever had, and with some truly excellent company. After we had been shown to our table, Christian commented in German to his friends before translating on my behalf that he had fallen in love with the waitress. He later added to this when two brutally good looking girls walked in with two other guys; how nice, they brought their brothers he said. Brilliant, just like being at home. When it came to the bill, my new friends insisted that I was their guest for the meal and would not let me pay for my own food. Such gents I had found! Following the pizza, Mortz mentioned that he once got incredibly drunk in the Spike Hill bar across the road. Christian decided that it would be a good idea to check it out again. I picked up the first round and we found that jazz-band; Evil Giraffes on Mars would be playing. 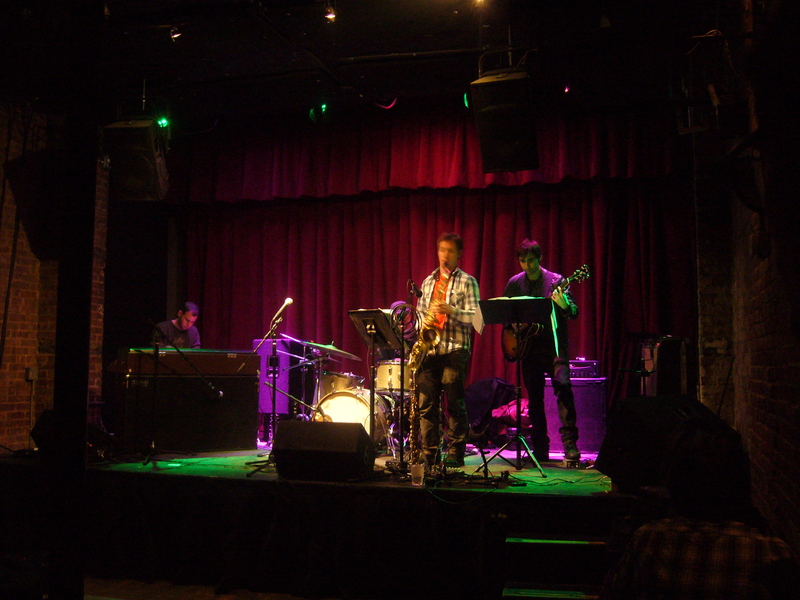 This was excellent news for me, as one of the things I really wanted to do while I was in New York was to see a jazz-band play and I’d achieved it on my first day. The band were pretty good and after enjoying a few beers we decided to call it a night and headed back to the hostel. This morning I was awake pretty early, free breakfast in the hostel for the first time since D.C. I couldn’t miss out! Once I’d enjoyed some fruit, cereal and a coffee (I know right, not like me.) The weather outside, as I had discussed with another traveller from the U.K was reminiscent of home; grey skies and pouring rain. This wasn’t going to stop me today. I got on the subway and made my way to Downtown Manhattan, spotting a Patrick Bateman lookalike on the way; cool slicked back hair, sunglasses indoors, blue collared shirt, red tie. Fortunately he didn’t kill me in the face with an axe and I got off around Union Square. I began walking through the skyscrapers of Wall Street and the under construction World Trade Centre buildings, spotting a small dog seriously wearing Wellington boots. Madness! My first plan was to get to Battery Park, which looked like a level from one of the old Tony Hawk’s Pro Skater games. 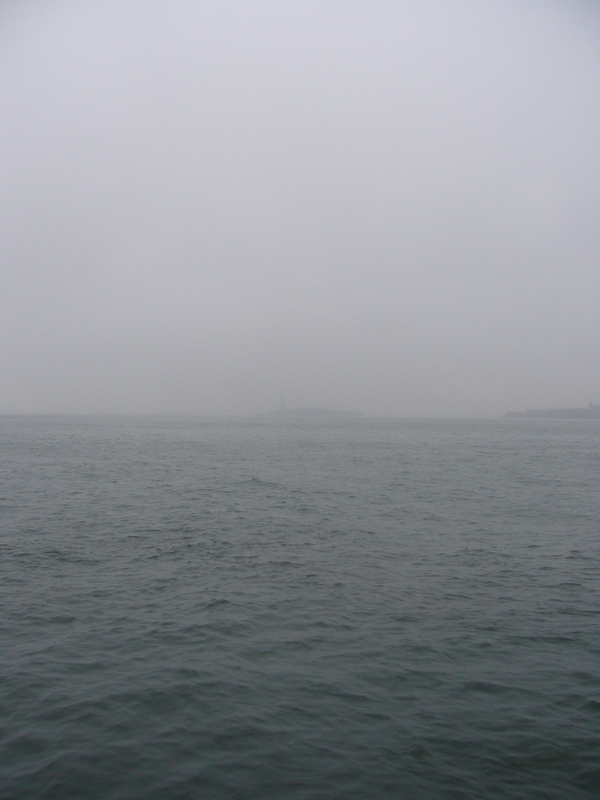 My intentions were to see the Statue of Liberty, but as you can see, I didn’t get much of a view. I definitely did see a silhouette of it through the mist though! I then made my way back to the World Trade Centre. It turns out you need to make a reservation online to get in to see the monument so I was only able to go into the visitor’s centre. There was not much to be told that I didn’t already know, 9/11 being one of the first major tragedies I can actually remember. There were a couple of artifacts; a fireman’s hat, melted aluminium and a twisted steel girder. A lot of construction work is going on in the area, with one of the new buildings soon to surpass the Empire State Building as the cities tallest.There is also a museum under construction to commemorate the terrorist attacks that had happened on this fateful site. 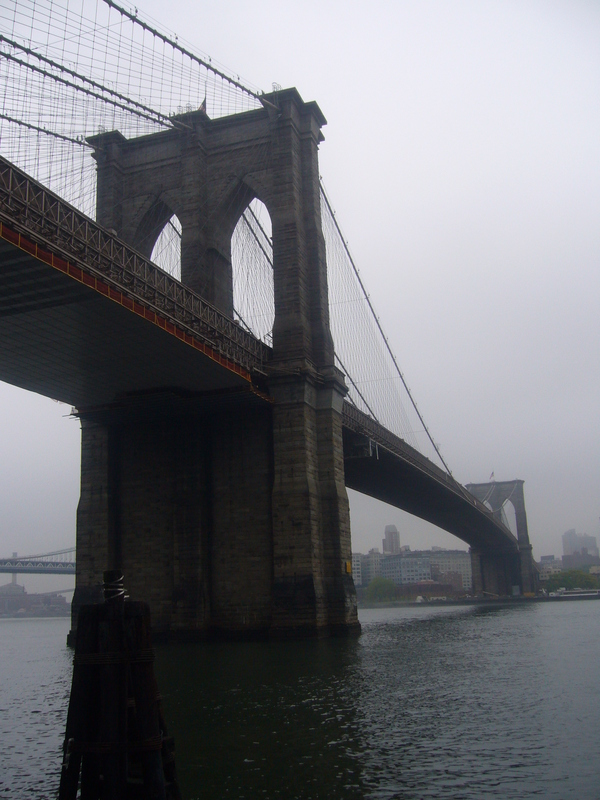 My next destination was to be Brooklyn Bridge, I only really wanted to go halfway as my intentions were to stay in Manhattan for the day. 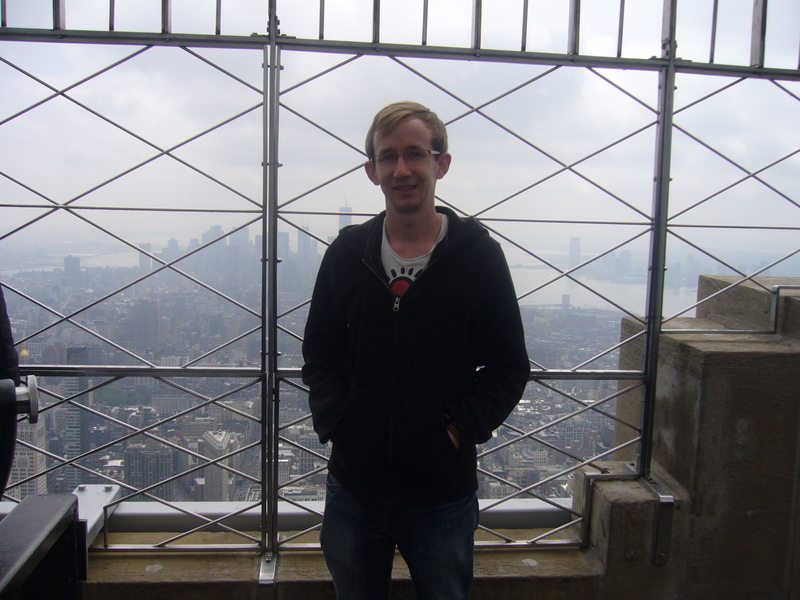 After about an hour of wandering around in the general area I found my way up onto the pedestrian walkway and crossed to the first tower, where, if the weather is clear I imagine you can get some pretty fantastic views of the Atlantic basin. 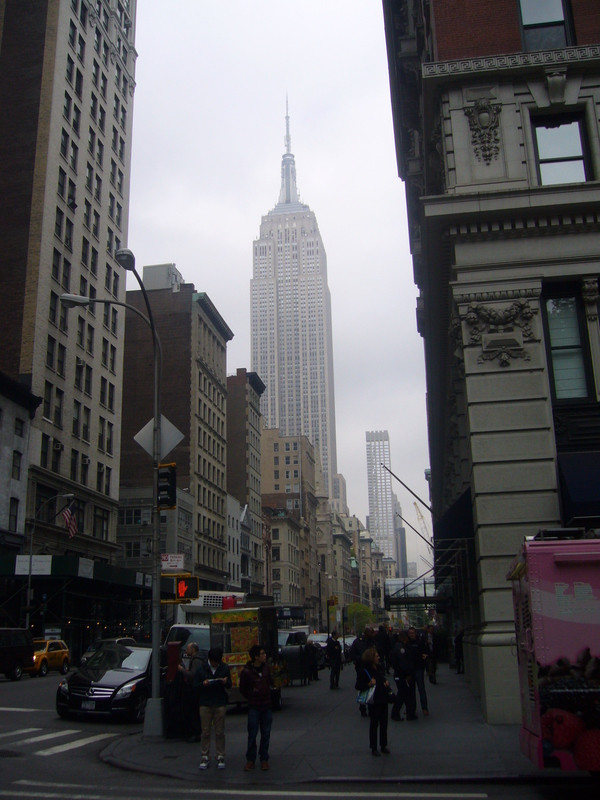 After returning into the city from the bridge I started to make my way up Broadway towards Midtown and eventually the Empire State Building. 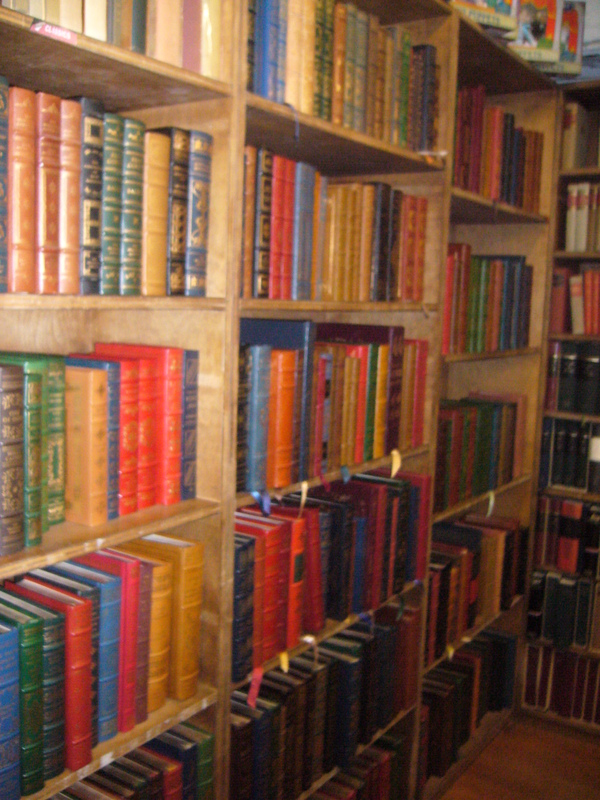 On the way I came across Strand Bookstore and immediately lost myself inside for well over an hour. Sadly, I didn’t find any of my favourite books with an aged, hardback cover and decided to move on. 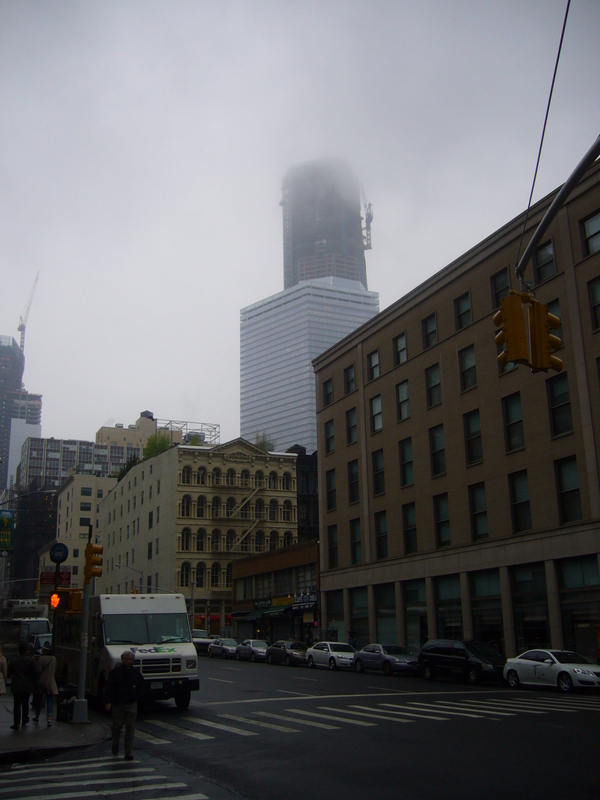 The 102-story cultural landmark soon came into-view and I’m pleased to tell you that the weather had began to clear. Last minute decision as I walked past the ticket entrance. Do I, don’t I? Turns out my brain decided I had to. 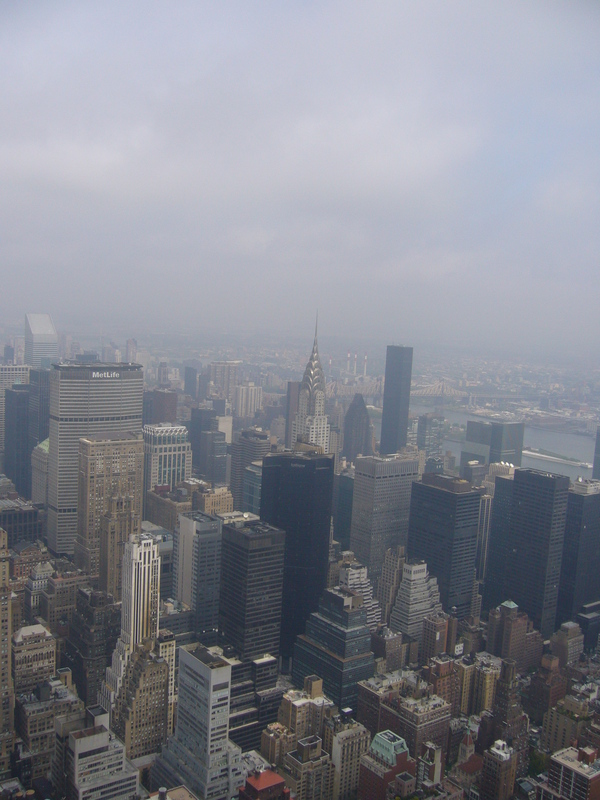 Standing in full at 1454ft tall, I was expecting to feel a little queasy when I reached the 86th floor observatory. I picked up a CityPass on my way, allowing me access to six attractions or landmarks over the course of my stay for the healthy bargain of $89. Once the tallest building in the world, the views from the observation deck are extraordinary, even when visibility isn’t at it’s best. I even took the time to find someone to take a photo of me! Aren’t you lucky. On my way out of the building I found myself meters in front of a protest. At the time, blissfully unaware that May Day had been selected by the Occupy group for a series of marches across the country. 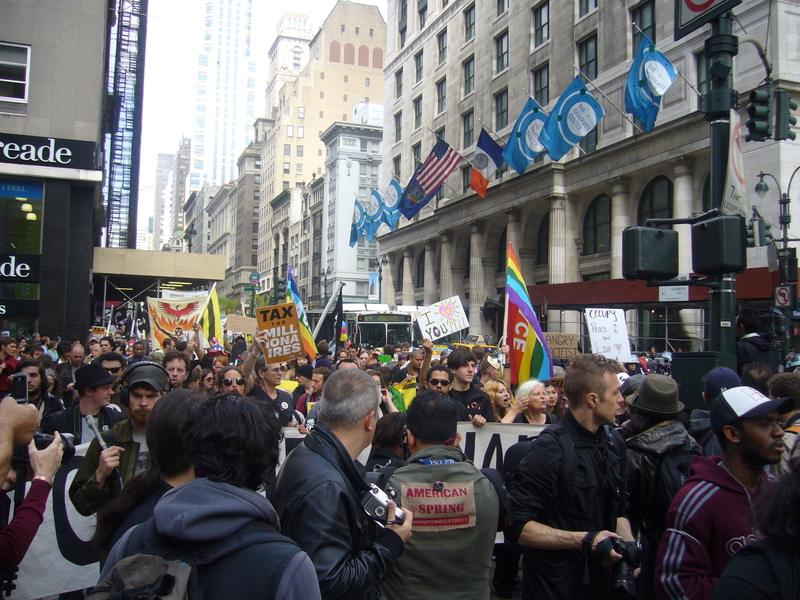 After a few minutes pinned against the wall as the youthful protesters marched against the machine, I was finally able to pass and continue with a little further walking through the city before finally deciding it was time to go. You might enjoy http://americantourismbook.com, where I post on the history of major American travel destinations as destinations.